6 Step 5. Have Fun! You’ll need to find the exact location of your leak. Be sure your spa is shut off before searching for the leak. Have a washable marker and a coin or piece of tape handy so that you can mark the location of your leak. If your leak is under the water line, you may well see air bubbles coming up from the hole point, and these bubbles will guide you to the location of the puncture. Follow any bubbles you see to the source and place your fingers over the puncture. Hopefully, that will slow or stop the leak. If so, progress! Place a coin or piece of tape in the general location, so that you’ll remember the spot, and ready your Lay Z Spa puncture repair kit (see below). Spray the liquid at the tub, working slowly in sections. Look for locations where the soap and water solution bubbles. Should your leak be on the outside of the tub, or on the top of the tub, you may have a difficult time finding the source. The easiest way to discover the location of the puncture is to fill a spray bottle with a diluted soap and water solution. Spray the liquid at the tub, working slowly in sections. You may want to use a washable marker to identify areas you have already sprayed. Alternatively, you may get a professional maintenace via water mold fire restoration of Houston. Look for locations where the soap and water solution bubbles. If you see any sign of bubbles, try spraying more soap and water on until you can get a confirmation that you have found the location of the leak. You may also be able to hear the tell-tale hiss of a small puncture if you listen very closely at the location of the leak. Once you have found the leak, mark it with a washable marker, or place a piece of tape over it to remind yourself of the location. Make sure that there is no debris, tiny glass shards, bits of plastic, etc. still embedded in the lining of the Lay Z Spa. Gently scratch at the area with your fingernail to get at anything stuck in the hole, and be careful not to gouge yourself with bits of glass. Be sure that the hole is clear of any dirt, and if you had to spray soap on the tub in order to find the leak, make sure you dry the area completely so that any residue that would impede adhesion is removed. 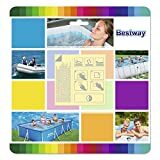 There are two primary patch types recommended by Bestway Products (the manufacturer of Lay Z Spa) for use in the Lay Z Spa line of spas. One is for underwater use, and the other is for above water use. If your leak is located below the waterline, you’ll want to repair it with the Bestway Flowclear 2.5 x 2.5 Inch Underwater Adhesive Repair Patches | 62091E. This patch kit is designed to go in an underwater environment and is applied with a very simple peel-and-stick design. The kit includes 10 patches, and each patch is 2.5″ x 2.5″ in size. In total, this patch kit will repair 6.55 square inches of area, and with 10 squares, you should be able to use this to fix several leaks. Just peel the back paper off of the patch, and keep the patch as taut as you can while bringing it to the location of the leak. Press it down into the vinyl lining of the spa, and smooth out any ridges or water pockets. Try to work from the center of the patch outwards, and your patch will be nice and smooth. If your leak is located above the water line, you’ll want to use the Bestway Glue and Patch Inflatable Repair Kit. This system is a little different from the underwater kit and does not rely on the weight of the water to hold the patch in place. The Inflatable repair kit uses a tube of vinyl cement and a clear PVC patch which measures 2.7″ x 7.8″. The patch can be cut to size if you don’t need a patch that large. Apply the vinyl cement to the area where the leak is, and place the PVC patch over the cement. Be sure it is securely sealed with no ridges or bumps, and wipe away any excess cement with a cloth. Hold it there for 30 seconds or so to ensure a good bond has developed. Regardless of design, let the patch cure for at least 30 minutes before use. We would recommend that you wait until the next day before use so that you can be sure that the patch is completely cured, but Bestway/Lay Z Spa seems to feel that 30 minutes is adequate to ensure proper adhesion of the patch to the base material. After you have waited the required amount of time, you are all set to use your Lay Z Spa inflatable hot tub without any concerns about leaks. Well done! If you decide that the damage to your inflatable spa is too extensive to warrant repairs, you may want to consider picking up a new inflatable spa. You can take a look at our inflatable spa reviews and buyer’s guide here. Hi I have a laz spa Monico just set it up again this year but when jet bubbles on on I have notice there is 2.5 inch seam that has come open , would I be able to glue it back or stick one of your under water patch over it , it is at the lower part of seam , I think the pressure of bubbles would probably pull it apart again , please can you give me some advice . That is a tough spot to patch, though with luck you’ll be able to seal it with one of the under water patches. It’s hard to say how successful you’ll be, as that’s a fairly sizable tear in a difficult spot. We wish you luck! I have the same issue and not sure what to do either for the best. Did you manage to sort this with the patch or did you use glue? If so which glue? I have a mspa Alpine m-019ls, the heater has stopped working so the water is cold, your help would be apreciated. Unfortunately we aren’t techs, and don’t have any specific knowledge of that inflatable spa. Your best bet is to contact M-SPA directly. Here’s a link from their Amazon page. should the pool be inflated or deflated when patch is put on. Ideally the pool should be inflated as much as possible for the patch to be put on. my Miami hot tub keeps losing air have repaired but is it possible to buy just the tub with no motor? Traditionally they should be deflated for the best seal. If yours didn’t seal well, it’s certainly worth trying again with a fully-deflated tub! Good luck.